Every so often you find yourself wishing you could remap your keyboard. Find a use for that oddball key you never hit. Or maybe you are on an older laptop and don’t have a Windows key. That’s where SharpKeys can come in handy. 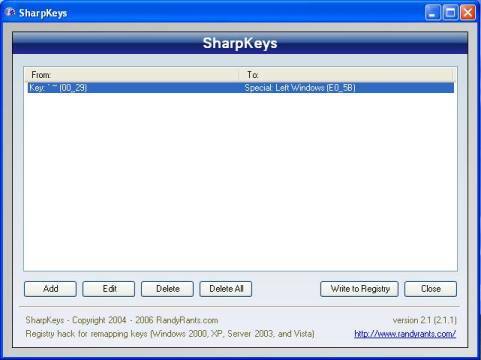 Available at http://www.randyrants.com/sharpkeys/, SharpKeys easily lets you change one key into another. You can select the key from a list, or just type it on your keyboard. In this example, you can see where I’ve remapped my ` (backward single quote mark) to the Windows key. To add a new key simply click Add, then in the dialog that appears select the to and from keys from lists, or type them. When you’ve done all the remapping you want, be sure to click the Write to Registry button, then you can close. Editing and Deleting key mappings works similarly. Be aware, in order for your remappings to take effect, you have to reboot your computer. Annoying, but understandable, and hopefully remapping your keyboard isn’t something you will do often. When you need to though, it’s nice to know this handy and free utility is there for you.